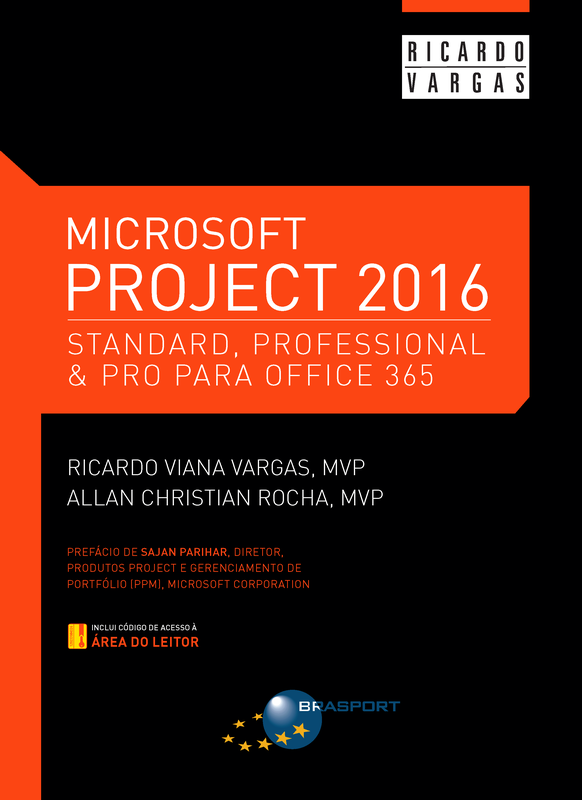 Ricardo Vargas apresenta, em parceria com Allan Rocha, Microsoft Valuable Professional (MVP), o livro que irá lhe ajudar a atingir o sucesso em seus projetos utilizando o Microsoft Project 2016. Agora pela sétima vez, é para mim uma alegria poder disponibilizar aos leitores este livro. Desde a versão 98 eu tenho publicado livros sobre o Microsoft Project, na minha visão um dos mais completos e versáteis softwares de gerenciamento de projetos do mundo, ideal para responder à crescente demanda por projetos nos mais variados setores de nossa sociedade. Assim como no livro Microsoft Project 2013, contei com a parceria de Allan Rocha, um dos maiores conhecedores da plataforma Microsoft para gerenciamento de projetos. Essa parceria permitiu que abordássemos os assuntos seguindo as principais tendências e estratégias desenvolvidas pela Microsoft, tais como: o Project Pro para Office 365 e a extensão do Project para uso de aplicativos. Como de praxe nas versões anteriores, adotamos a mesma estrutura dos demais livros, propiciando um entendimento mais rápido e direto do programa, da mesma forma como foi feita a edição anterior. Portanto, diversos conceitos já apresentados em livros anteriores foram transcritos na íntegra para este livro. Para os usuários que já adotavam os livros anteriores como uma referência de trabalho, essa manutenção na estrutura permitirá que se utilize este novo livro também como referência, tornando essa transição um processo natural e intuitivo. Esses novos recursos foram inseridos dentro do contexto do livro, visando dar uma fluência de leitura similar ao desenvolvimento de um projeto. Espero que gostem do livro. Sucesso a todos e ótima leitura! Microsoft Project has been the tool of choice for project managers for over 28 years. With Project 2016, we improved Project’s already powerful capabilities to help project managers and their teams stay organized, manage resources, work together easily and, of course, deliver projects successfully. Project Online, Project and Portfolio Management (PPM) solution built on Office 365, frees organizations from the work of managing Project infrastructure and enables everyone to collaborate on projects from virtually anywhere. The result is that the new Project is lightweight and flexible enough for small teams, yet robust enough for the largest enterprises to deliver projects on time and under budget. Whether you are an experienced Project user or new to the product, you will find valuable, new features to make it quicker to plan and manage projects, request and allocates resources, and to share information with others. Vibrant timelines and task path analysis make it simple to find and emphasize important parts of a project. The scheduling engine is more powerful than ever and offers advanced capabilities like conditional what-if analysis, which lets you respond to the unforeseen by quickly evaluating changes in project plans. And you only have to look as far as the new out-of-the-box reports (including new burn down reports for Agile) in Project Standard, Project Professional and Project Pro for Office 365 to find powerful, functional design. Project users tell us that they rely on the out-of-the-box integration of Project Pro for Office 365, has all the features of our traditional software (Project Professional) and is delivered as a cloud subscription, with other Microsoft products like Microsoft Office and Microsoft SharePoint. Project 2016 makes broad use of the enterprise productivity in Office 365 and on-premises. For users who have Office, Skype for Business is now integrated seamlessly with Project Pro for Office 365 and Project Professional 2016, offering many ways to save time and share information about resources, schedules, and budgets. Pasting reports and timelines specifically formatted for PowerPoint and Outlook from Project makes reporting progress simple. We are really excited about our cloud offerings – Project Online and Project Pro for Office 365 – that enable teams of all sizes to get started quickly, manage projects and resources from virtually anywhere and meet their unique needs leveraging Add-ins available in the Office store. Using Project Online, you can effectively evaluate ideas or measure the strategic contribution of competing requests to determine alignments and streamline project initiation. Furthermore, with the out of the box reports you can make data driven decisions by equipping team members with the information they need to stay informed and make better decisions. Of course, tools by themselves can only get you and your projects so far. Training is essential, and the knowledge found in this book will have you well on your way to project management excellence with Microsoft Project 2016. Equip yourself with the right tools, arm yourself with knowledge, and seek experiences today that will enable success in managing the important projects of tomorrow.